We know success in school and life depends on more than academic ability alone. 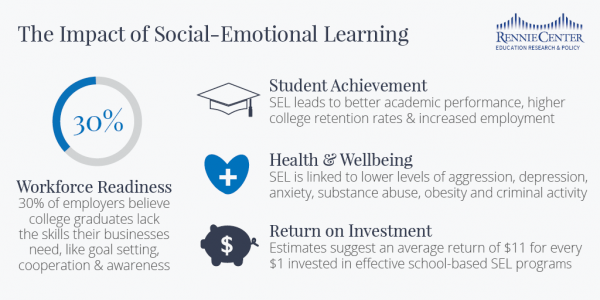 Research shows social-emotional skills have a significant impact on students' academic performance and persistence in school, as well as their lifelong health, wealth, and well-being. 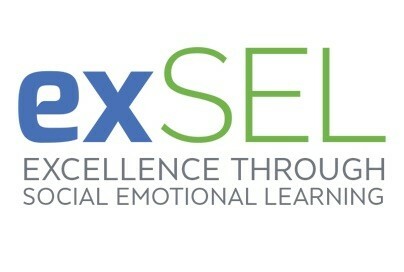 The exSEL Network—and its partners the Rennie Center and Transforming Education—work together to gain critical insight on how to support the development of social-emotional skills through changes in policy and practice at the district, school, and classroom levels. Participants are increasing their understanding of the content and importance of SEL, building their capacity to use actionable data to assess and guide the development of students’ social-emotional skills, and becoming part of a community where educators can learn from one another and support each other’s systemic and practice shifts. Districts have the option to engage in deeper data analysis work, using existing academic and behavioral indicators to guide their SEL efforts while developing new and effective strategies for tracking and measuring student progress. The 2018-2019 exSEL Network includes Attleboro Public Schools, Blackstone-Millville Regional School District, Bridgewater-Raynham Regional School District, Brockton Public Schools, Brookline Public Schools, Grafton Public Schools, Fitchburg Public Schools, Lowell Public Schools, Marshfield Public Schools, Mendon-Upton Regional School District, Millbury Public Schools, Monomoy Regional School District, North Andover Public Schools, Norton Public Schools, Shawsheen Regional Technical School, Shrewsbury Public Schools, Tantasqua Regional School District, Weymouth Public Schools, and Whitman-Hanson Regional School District. Over the course of the 2017-18 school year, nine Massachusetts districts came together to form the first exSEL Network cohort. The districts—Brockton, Canton, Fitchburg, Mendon-Upton, Millbury, Milton, Monomoy (Chatham and Harwich), Tri-Town (Boxford, Middleton, and Topsfield), and Whitman-Hanson—gained greater awareness of what it takes to integrate SEL into daily practice, developed preliminary integration plans, and examined strategies for measuring SEL outcomes. Many of these districts will return as part of the 2018 – 2019 cohort. The project is led by the exSEL Coalition—whose members include the Massachusetts Association of School Committees, Massachusetts Association of School Superintendents, Massachusetts Organization of Educational Collaboratives, and Massachusetts School Administrators Association— along with the Rennie Center and Transforming Education.